Locked ABS-plastic enclosure secures a 1.9 L (2 qt.) or 4.7 L (5 qt.) sharps-disposal container for a secondary barrier of protection. Viewing windows on front and sides make it easy to monitor the container fill level. This wall enclosure has a variety of convenient features. All cabinets are universally keyed, and the viewing windows on the front and sides make monitoring the fill level easy. Certifications: Meets or exceeds JCAHO, OSHA, and NIOSH/CDC standards and requirements. 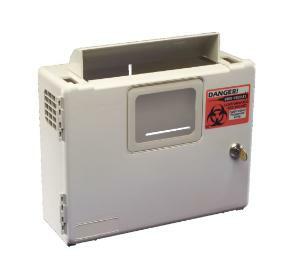 Ordering information: For sharps containers, see the In-Room Sharps Disposal Systems series from Covidien.